Cantaloupe are often picked, and shipped, before fully ripening. Post-harvest practices include treatment with a sodium hypochlorite wash to prevent mold growth and salmonella growth. However this treatment, because it can mask the melon's musky aroma, can make it difficult for the purchaser to judge the relative quality of different cantaloupes. Choosing a ripe melon depends on the preferences of the individual. For a heavy musk flavor and softer flesh look for an Eastern Shipper with a strong yellow color, no stem (peduncle) attached, and a strong musk aroma. For a sweeter, crisper melon look for a Western Shipper without stem (peduncle) and a mild musk odor. For a very sweet melon with little or no musk choose a fruit that has the stem still on the fruit and no aroma. 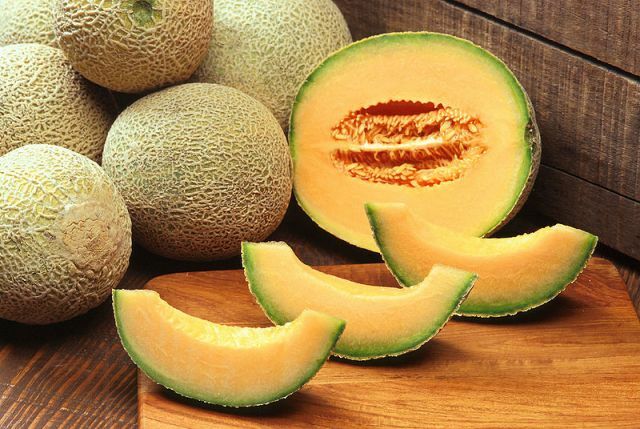 Cantaloupe is normally eaten as a fresh fruit, as a salad, or as a dessert with ice cream or custard. Melon pieces wrapped in prosciutto are a familiar antipasto. Sanjeev Kapoor describes the charentais variety: "the orange, sugary and fragrant flesh makes this fruit popular both as a dessert or main course.